Seed stitch consists of single knits and purls that alternate horizontally and vertically. 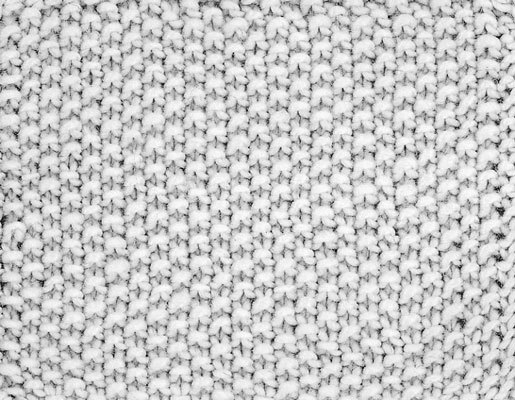 Seed stitch gets its name from the texture of the knitted fabric — the little purl bumps look like scattered seeds. Although a little more complicated than the garter and stockinette stitches, seed stitch creates an interesting texture and is included in many patterns. Like garter stitch, seed stitch lies flat, making it a good edging for a sweater border and cuffs. The knitted fabric also looks the same from both sides, making it a nice choice for scarves and other pieces of which both sides are visible. When working seed stitch, you alternate between knit and purl stitches in each row. The trick to creating the little “seeds” is to knit in the purl stitches of the previous row and purl in the knit stitches of the previous row.